If you have found an activity that makes you feel this way, you are blessed. If you have not, keep being curious til you find it. Maybe it is not one activity but many activities within a general topic. Tap into your mental space, your imagination. There are 1000+ different things you can do to access creative flow. The sooner you discover what really lights you up, the sooner you have a fast-track ticket into the creative flow. If you still have no idea what to try, just remember Be curious.Keep an open mind. Consider wondering around the library or a book store. Here’s a list of some examples of activities to try: crocheting, knitting, embroidery, cooking, photography, painting, watercolors, piano, ukulele, illustration, hand lettering, scrap booking. This list can be as big as your imagination. If you look around, you will see people in the flow all the time. Children are pros at it. A few years ago my family was on vacation in Door County, Wisconsin. We went to Hands On Art Studio where you can make pottery, jewelry, metal work, fused glass, mosaics, and beading, etc. We have been going to Hands On for years and it is my favorite thing to do in Door County. You pay a nominal fee for the studio time for the whole day and then pay for the supplies you use that day. It is a place that embraces the concept of creative flow. My family and I were in the fusible glass studio. 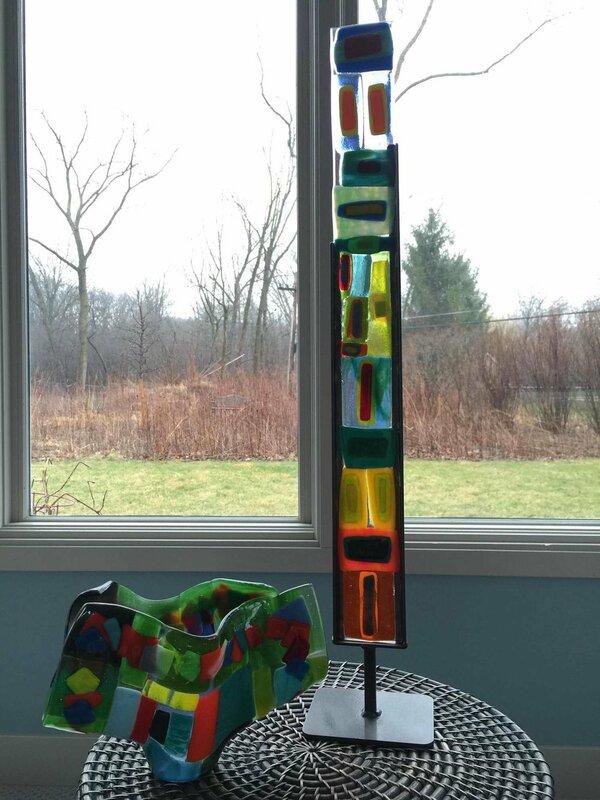 Fusible glass is a technique where you glue down pieces of colored glass onto an clear piece of glass. Then Hands On staff put it in the kiln to melt or fuse together. It was so crowded on this particular day that we were in the outdoor patio with just a roof covering us. It started to storm outside and rain flooded the patio. Everyone was so intent on their projects, I had to say it is too wet to work guys and your glue is not holding the glass anymore. They had not even noticed. We went inside. Then the storm knocked out the power. We all (about 15 of us) kept working in the very low light of the back up generator. We were all touching shards of sharp glass (including our children) in the low light. No one complained and we all kept working. We had a vision and we were in the creative flow. We were not stopping. The staff noticed more people kept coming to start a new project and I think they kind of wished we would all leave. After all, it was still really storming outside. No one left. Amazing. The power of creative flow. How go we get into creative flow? We start by finding inspiration on a regular basis and then turning that inspiration into our art of choice through our creative habits. Creativity is a tool to get into the creative flow. Step out of time. Be in the moment. Express yourself. Live more mindfully. Clear your head. Bring peace to your day. So start a creative habit. Build a creative practice. Design one that fits into your existing routine. You will find your creative practice becomes a continual journey of self-care that feels good and keeps you present in the moment while being creative doing things that you love on a regular basis. More creativity. More joy. The benefits reinforce the practice. Our intention is to use this creative time as a stress reducer, a time of relaxation, like a meditation practice. Let go of rules. Let go of judgment. It’s all just self-expression.